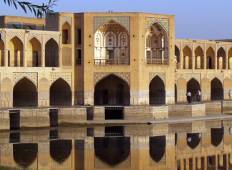 Find a culture trip that explores Iran. There are 109 cultural tours to choose from, that range in length from 4 days up to 30 days. The most popular month for these tours is May, which has the most tour departures. "Tour certainly provided in-depth awareness of the Iranian culture; the political..."
"Very professional people and it’s great experience with them." "The esperience was great. Amin, our tour guide, was awesome and the services (transportation..."
"Thank you for this amazing trip we had. 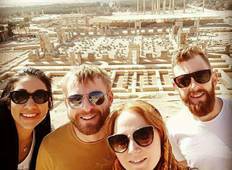 Iran is a beautiful undiscovered country..."
"Tourradar is probably one of the most incompetent tour operators i have come across...."
"Overall, it’s his was a great trip! I would 100% recommend travelling to Iran...."
"Iran is a colourful clash of culture, history, the past and the present. Prepare..."
"I travel a lot but this trip will stay with me for a long time to come. Family and..."